Who was Johannes Ockeghem? Highly trained singer-composer and loyal servant of the French crown? Deviser of seemingly insoluble musical puzzles? Composer of highly refined settings of courtly love poetry? Master of densely inscrutable counterpoint? 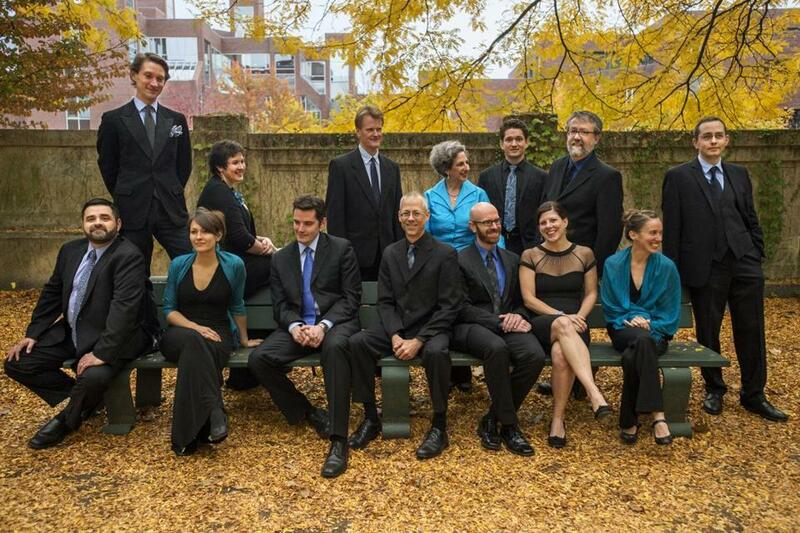 With their ambitious project entitled “Ockeghem@600,” Scott Metcalfe and the musicians of Blue Heron have set out to perform the complete works of this much respected but often misunderstood composer. In 13 concerts distributed over seven seasons, Ockeghem@600, launched in 2015, will be completed in 2020-2021, in time to commemorate the 600th anniversary of the composer’s birth. The fifth concert in the series played on Friday at the First Parish of Lexington and on Saturday at the First Church, Congregational, in Cambridge, where this reviewer heard it. The program was organized around a youthful work, Ockeghem’s setting of the Mass Ordinary (Kyrie, Gloria, Credo, Sanctus, and Agnus Dei) known as the Missa Caput. The identity of the cantus firmus on which all movements are based was revealed in 1950 by Manfred Bukofzer: Caput (head) is the final word in a chant from the Sarum (Salisbury) rite practiced in Britain before the Reformation. The text tells the story of Peter at the Last Supper, when Jesus washed the feet of the apostles. Peter at first refused, thinking Jesus should not demean himself, then realized the importance of the gesture, saying: “Lord, not my feet only, but also my hands and my head.” Working in France, Ockeghem is unlikely to have had access to the Caput melody in Sarum chant books. But he seems to have known the anonymous English Caput Mass that was preserved in a manuscript copied in the mid-15th century in Bruges as well as in a set of manuscripts copied around the same time in northern Italy. In fact, although Franco-Flemish singers and composers dominated European musical life from the mid-fifteenth century until well into the sixteenth century, large numbers of works by English composers reached Europe during the period from 1400 to around 1450. English music that would not otherwise have survived was abundant in manuscripts from northern Italy and Germany, and exerted considerable influence on continental composers. And well-trained they are. In the absence of countertenor Martin Near, ill with the flu, mezzosoprano Laura Pudwell moved tirelessly from one group to another to maintain the treble part. Like her, the other participating singers — bass-baritone Paul Guttry, baritone David McFerrin, tenors Sumner Thompson, Owen McIntosh, Mark Sprinkle, and Jason McStoots — are all accomplished soloists adept in diverse repertories, yet able to meld together in a well-tuned ensemble. Most of the time they were grouped in various quartet combinations, one on a part. One of the great virtues of Metcalfe’s approach to medieval and Renaissance ensemble polyphony is the way in which his singers maintain the individuality of their voices within a variety of perfectly-blended groupings. In Ockeghem’s Mass, the long Caput melody is stated once in the Kyrie, twice each in the Gloria and Credo, and twice each in the Sanctus and Agnus Dei. In addition to the cantus firmus, Ockeghem borrowed from the English Mass the more audible feature of “motto” openings that join the Gloria, Credo, Sanctus, and Agnus Dei thematically to one another. As in the English Mass, these four movements all open with sinuous long duets for the upper voices that contrast pleasingly with the four-voice sections. The entry of the cantus firmus always announces itself with several prolonged notes in the bass before continuing in shorter note values that blend rhythmically with the upper parts. The opener, a short Ockeghem Kyrie, stands somewhat apart from the other four movements of the Mass in that it was apparently not modeled on the much longer English Kyrie with its troped text additions. The Gloria followed, divided into two large sections, the first in a leisurely triple meter, the second in a slightly faster duple meter. In the remainder of the program, the movements of Ockeghem’s Caput Mass were interspersed with motets and songs by his predecessors and contemporaries. The song-like Marian antiphon “Quam pulchra es” (How beautiful you are) on a text from the Song of Songs, by the older English composer John Pyamour, with its smoothly consonant harmonies and sinuous melodic lines, was in complete contrast to the Gloria. Following in the same tradition were two three-voice pieces by Walter Frye, another English composer whose works survive almost exclusively in continental manuscripts. His English ballade “Alas alas” and widely known Latin antiphon “Ave regina coelorum, mater regis angelorum” (Hail queen of heaven, mother of the king of angels) are stylistically similar in their rhythmic flexibility and smooth melodic progression. The bright “G major” (Mixolydian) sound of the Gloria from the English Mass projected another contrasting sound with its straightforward phrase structure and clear cadences. Ockeghem’s Credo follows the English model in introducing the shift to duple meter and a long upper-voice duet at the apex of solemnity on the words “Et incarnatus est” (And he was born) and a restatement of the cantus firmus at “resurrexit” (he rose again). After the intermission, it was time for more songs: one by Walter Frye, and two by Ockeghem’s revered older contemporary, Gilles Binchois. Here the Blue Heron singers showed their versatility in three different configurations. In Frye’s French rondeau “Tout a par moy” (All by myself), Laura Pudwell sang the treble part, with Mark Sprinkle on the contratenor and Jason McStoots on the supporting tenor; in the rondeau “Vostre tres doulx regart plaisant” (Your very sweet and pleasing look), McStoots took the top part, supported by Sumner Thompson and Paul Guttry. “Deuil angoisseux” (Anguished sorrow), Christine de Pizan’s ballade of mourning on the death of her husband, sung by Laura Pudwell, Sumner Thompson, and Jason McStoots, was one of the highlights of the evening, its recurring opening on a bright major triad a surprising expression of sorrow. All seven singers were on stage for the final pair of Caput Mass movements, the Sanctus and Agnus Dei, doubled voices in the Sanctus and Osanna sections alternating with one-on-a-part quartets in the Pleni sunt coeli, Benedictus, and Agnus Dei. Everything about the concert seemed designed for the furtherance of Blue Heron’s total Ockeghem immersion, from the beautifully produced booklet complete with informative notes along with texts and translations, to the pre-concert talk by Professor Sean Gallagher, scholarly adviser to the project. But above all, vibrant performances by a roster of highly engaged singers accomplished the mission. Comments Off on Missa Caput?